Althea Korea (Ph.Althea.Kr) is celebrating its first birthday with a giveaway. If you have not heard about Althea, it is a popular Korean Beauty online shopping site that ships internationally from Korea straight to your address here in the Philippines. Here's the good news! When you order from July 20-30, 2016, you will get this fabulous pink limited edition Birthday Box + DIY Party Kit. Please take note that it will be available while supplies last. 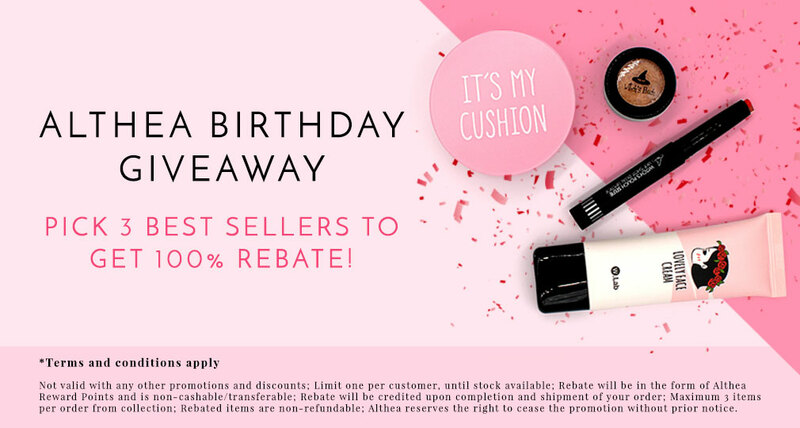 Pick 3 Top Sellers max and get 100% REBATE! Please note that rebate will be credited to your account upon completion and shipment of your order. Be one of the first 1,500 shoppers to receive free goodies- FULL SIZE BEAUTY PRODUCTS. All you have to do is to use Althea promo code: ALTHEATURNS1. Limit one per customer until supplies last. Were you able to receive your Althea party kit already? Wish Althea a happy birthday on Instagram and don't forget to include the hashtag #AltheaTurns1. You now stand a chance to win a MacBook Air, Ipad Air 2, iPhone 6S, Galaxy 6S EDGE, Canon EOS M10 Selfie Camera, Althea Credits and beauty hampers from Althea. Total prizes to be won is worth KRW 10,000,000. Contest will run until August 15, 2016. Althea shopping process is very simple- Pick A Product, Add To Bag and Checkout. Free Shipping on orders Php 1,500 and above. PLUS, get Php 150 credit when you sign up TODAY!